Even though latin jazz is itself a hybrid form, the Fender Rhodes doesn't fit the form easily, because of the multiple roles that the acoustic piano usually takes. While the percussionists are crossing the rhythms from all directions, the acoustic piano often sits back and holds a repetitive "backbeat", acting as a percussive centre more than a tonal or harmonic leader .... except of course for a freak of nature like Eddie Palmieri, who just throws the distortion on the Rhodes, plays the organ with the other hand, and plays all the rhythmic, harmonic and percussive centre roles all at once ! So the presence of a rhodes piano in latin music tends to indicate all sorts of other experimentation, because it's not always just taking the acoustic piano role, as it sometimes does in other forms of 70s jazz. Although I've made a somewhat trad-looking cover image, this compilation explodes in all directions from latin. The players here are all pushing into other forms - latin-funk (Mongo Santamaria, Cabildos, Pucho); latin-jazz (most tracks); sometimes just exploring deeper into jazz forms (Ray Barretto, Gato Barbieri). The rhodes or wurlitzer pianos are just some of those new colours, and here they're often combined with an acoustic piano or a set of vibes within tracks. 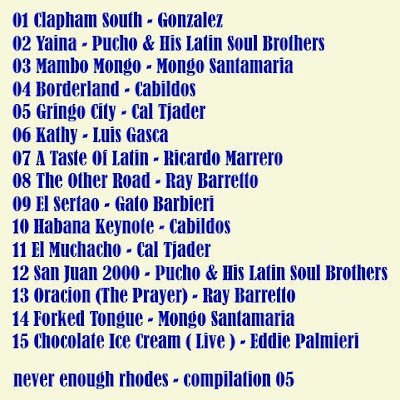 Apart from all of those thoughts that have arisen while compiling - my main aim was to make you a HOT latin funky jazz compilation that you should, of course, play as loud as possible! Right, so I spelled "Gonzalez" wrong. If any of you are using the covers, I've corrected the version on the webpage, although the download version will still have the wrong "Gonzales" spelling. Man, I love homemade comps. Thanks for the time and work you put into this. It sounds cool. Keep 'em coming. Great place you got here! My word verification is "tczsdxmm"
which looks like the phonetic representation of Joey Ramone saying "taxidermy." It's not really significant, but it looks funny. Do you have the Sardaby album "Gail" ? Or may be the Ira Khris Band 'jazzanova'? Sorry, I meant to say thanks earlier for the 'Cabildos' album. I actually already have it - you may have noticed that there's a few tracks from it on this compilation, but i'm sure other readers will appreciate the chance to download this! Also as I posted in the other thread, I don't have the Cunimondo albums you are looking for. Just comin' back for more... The selection on no. 6 was excellent, and since I've become a Latin junkie as of late, I'm sure this one will be just as good. Keep it up mon frer. Cool, Vincent - hope u enjoy it. 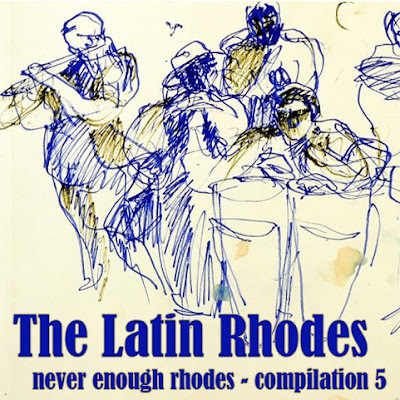 Just wanted to let you know that LATIN RHODES 2 is now up. I missed this,thank you Simon!! Thanks also Robert and Louis for comments. Renée Geyer - "Rarities E.P."